For Alto Saxophone. Jazz/RandB. Includes printed musical score and compact disc: you hear both parts played in stereo, then each duet is repeated with the first part omitted and then the second part, so you can play along. Published by Music Minus One. This great collection of jazz duets gives you the opportunity to accompany saxophonist Hal McKusick and the Benny Goodman Rhythm Section. Suitable for beginning players, all the selections are great fun. 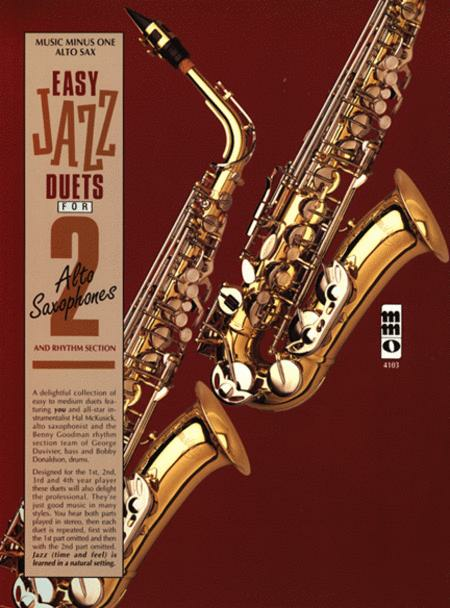 This album allows you to play either duet part. Soloist: Hal McKusick, alto saxophone. Ensemble: The Benny Goodman Rhythm Section: George Duvivier, bass; Bobby Donaldson, drums.